Today we will be showing you the Cats Whisker, a fairly modern lure for stillwaters. Do not be put off by this fly’s flashy appearance. It is relatively easy to tie and can be very effective. It was always the first choice of my fishing colleague Ken until I managed to convert him to nymphing. He still sneaks one on when the going gets tough. The original version was tied with the head from bead chain from the plug in the sink. I prefer to use a gold or siver metal bead and I dont think it matters which you use. The popular colour chenille for the body is fluorescent green but orange and red are good alternatives. 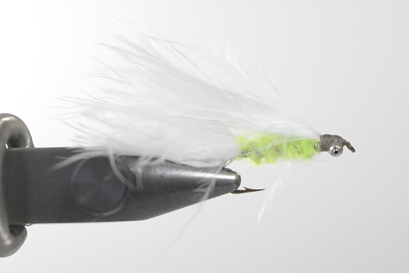 You will find the Marabou used for the tail and wing strange to use at first. Just remember to wet the base of the fibres and form a shuttlecock as shown. You will find the fibres get everywhere, if you dont have a den you may have bother with the wife! I would like to think you for a wonderful series of fly tying videos. I find them very educational. I’m new to fly fishing and would love to get into fly tying. I tied a rough looking Cats Whiskers on my friends vice today, using green fritz instead of chenille. I got lost a little on the half hitch knots but having watched the video again I can see what I done wrong. I’m looking through the Internet now looking for a tying kit so I can get into this great past time. I’ll be tying flies soon so I’ll be watching more videos to see what patterns i could tie. Looking forward to catching a trout on a fly that I have tied myself. Thanks for your comments. The more you tie the easier it gets. Thanks David and the team for a great set of tutorial videos. Well executed with enough information to show you how to tye a fly while not being loaded with technical jargon and other info to confuse beginners such as myself. I had material to tye a Cats Whisker in my starter kit but couldnt make out how to tye it right. But having watched your video and paused it while I caught up it is now one of the easiest flys to tye. I think one thing I had learnt from your video was that it really doesnt need to be as perfect as I thought it did I can now tye a fly quicker and get the same sort of finish I did when it took me half an hour for 1 fly. As I said thanks for the effort. Good show. Lets see more keep up the good work. I’m a beginner in fly tying. on friday night, caugth a 6 lbs (stocky) rainbow on saturday early morning. what a fantastic way of fishing. Thank you very much mr. cammis and the staff. A lure is usually an ‘attractor’, much more flashy, fished on conventional fly tackle. It can represent a small fish or any other large food source for the fish. A fly is meant to be an imitation of aquatic insects at vaious stages of its transformation from a ‘grub’ to an adult fly. Fly dressers seek to make exact imitations of Gods handiwork whilst we fly tyers are lower mortals who seek to tie an imitation good enough to fool the fish. i know you mentioned the cat’s wisker being a lure but what is the deifference between a fly and a lure. again, great web site – fly tying now going great guns. last week caught 4 trout including 2 1/2 lb ‘ er at dewent water in northumberland. For the first time caught on hand tied fly, by myself, following your on line instructions. big thrill. Thanks again for re – lighting my entusiasm for fly fishing. Glad that the videos helped you get over the first hurdle. From now on it will just be practice and looking out for new ideas. I have been in a fly fishing club for years and can never make the fall or winter fly tying course.I have many fly tying manuals but can never get my flies to look like the picture.This afternoon I have found your site and have tried my hand at the flies in beginners lessons 1 to 5 and am proud to say they lok very much like yours.I can’t wait until next year to try them out. have been looking for a great site like this for a long time. hope there is more to come from you . thanks for showing me an easy way to tie . Dave ;& crew thanks for the knowledge;I hope you stick around; you are very appreciated. i think your fly tying lessons are very very good and very useful. ive been looking around on the web for a couple of days for good fly tying lessons, and this one is by far the best. P.S your really good at fly tying! Thank you very much for taking the trouble to educate us novices in the art of fly tying.although I have been tying for a considerable time I have never been successful with cats whiskers until now. I hope you will continue with your easy to follow video’s. Thank you for such a wonderful series. Keep it up. I have my first fly tying vise on order, and as soon as it arrives, I plan on using your videos to get started. thankyou david for such a well executed and clear set of videos. having also just started fly tying, there are certain basics that I have been unclear on, and the tuition has made these points much more understandable. I currently use a whip finish tool, but the day may come when I am matching the hatch on the bank, and the tool may not be available. could you please produce a mini-vid showing how you do the double half hitch? I cannot quite see from the lessons what it is you are taking hold of when you ‘pull through’ after doing the two loops around your finger. as a suggestion, could you produce a vid which demonstrates individual actions, such as forming and tying dry hackles, dry/wet wings, choosing suitable materials? I think this would make progress for me at least much faster, as currently I am limited to those flies I can either find step-by-step, or invent. I look forward eagerly to your next productions.